Trust is a knowing of something greater than you; a knowing that in every moment, that moment is perfect. Trust is not buying into the stories of I should, I could, or next time I would. So many moments are wasted on worrying about the past or the future that we simply forget the present and the true power of trust. 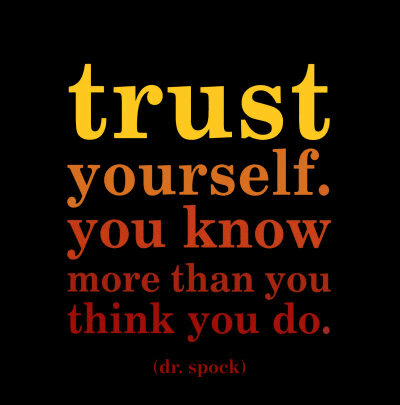 To trust is to know; to know is to trust and this is the very concept that the mind cannot grasp. Our minds prefers obsession; the trick of the monkey mind. The Mind doesn’t want to give up control and trust. The Mind prefers to repeat over and over again scenarios and make believe moments rather than to be quite and simply be with the truth of the moment. Then again, that is Mind’s job; to think, to do, to work. When we are born into this world we have trust, but somewhere along the way in our childhood, someone takes it from us and our ego mind takes shape. Now over 30 years later, I am again presented with this trust lesson. I can’t tell you how many times it has reentered my mind, but I suppose it will keep returning until I understand it and learn from it. I tend to obsess over things I can’t control, especially when it comes to my work. If I have a big gig coming up I will usually think about it until I make myself sick. This time, however, for the first time, I didn’t make myself crazy over it. I let go. I did my part and now I must trust my instincts and the universe. Trust is something I feel deep inside my body, it resonates in my solar plexus and it’s almost as if I can see certain outcomes without the attachments of story. The outcome is always what I need, regardless of how much my ego wants it to be different. We truly are always in the precise moment in which we are meant to be. To trust is to be in alignment with the laws of the universe which is unfolding perfectly with each passing moment. It is now. It is here. It is being. It is trust. Today, trust something that has been weighing on your mind and that you have wanted control over. Trust that something bigger is guiding you and open your heart to allow trust to present itself to you. Affirmation – Today I will trust all circumstances and I release my fears and worries to the universe.